This was the opening game of the Indiana State Playoffs and featured Eastbrook and Western Boone. I had watched Eastbrook earlier in the season, at Ball State where I took photos for PAFOOTBALLNEWS.COM. This was my first time seeing Western Boone, a high school, I recently drove by on my way home, from covering the twelve semifinal games in Iowa. Eastbrook would get the ball first and run six plays, while picking up 22-yards. 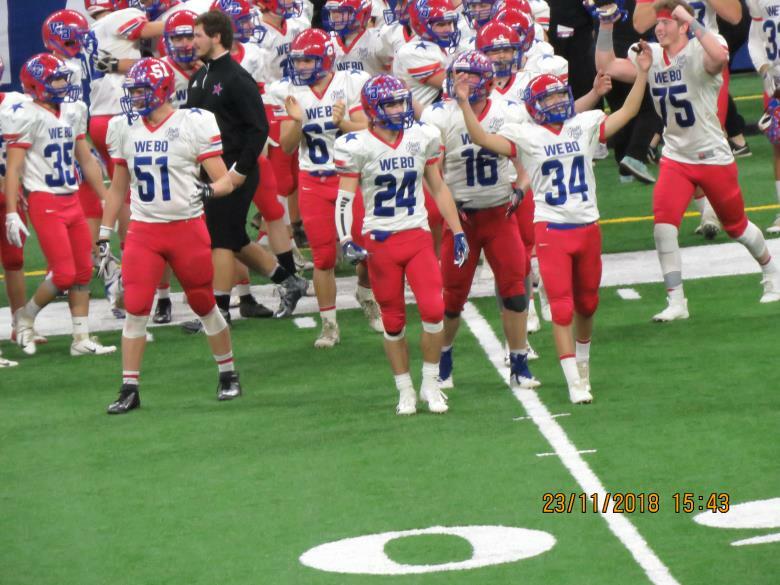 The biggest play on the drive came from the Western Boone defense where Deetz Holdrof got to Xaine Kirby on third and two and held him for no gain, forcing a punt by Zane Shilts. On the Western Boon drive Spencer Wright completed a 51-yard pass to Lucas Kemodie, but the drive fizzled put shorty after the big play and a 37-yard punt from Peyton Yong followed. On the Eastbrook drive that total 43-yards on 10-plays the theme would be Devin Weakly making tackle after tackle for Western Boon, in all he had six tackles. Holdrof also turned in another fine defensive play when he got to Justin Singer for a yard loss. 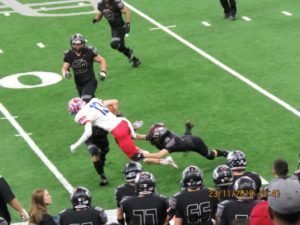 Eastbrook would get things going with 1:01 left in the quarter, on a Dylan Bragg to Clay Dalton 22-yard pass play Connor Hole made the tackle before the play could go any further. The drive would get a big boost when Bragg hooked up with Clay Dalton for a 31-yard gain and giving the Panthers a first and goal at the Stars 7-yard line. After losing a yard on first down due to a fine play by Cortez, who got to Justin Singer in the backfield Dylan Bragg would run into the end zone for the game’s first score. 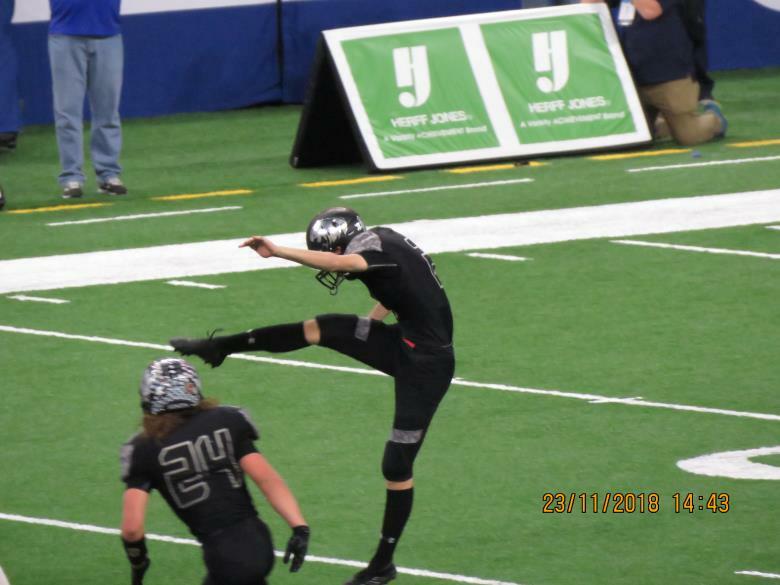 Zane Shilts connected with the point after kick to make this a 7-0 game, with 11:12 left in the half. Kruze Washington would take the ensuing kickoff 24 yards to the 28 yard line, where the Stars would begin their drive. Spencer Wright would connect with Logan Benson to get the drive started. The same combo hooked up again for a 12-yard gain and all of a sudden the sleeping Stars offense seemed to have awakened from the first quarter nap. Wright connected with Lucas Kemodle for 13-yards. The Drive would end with a Wright to Benson 9-yard touchdown pass, after Elliott Young hit the point after the game was locked at seven, with 9:44 left in the opening half. The Stars defense would get a three and out by its defense, in a large part because of the play of Holdrof, who Stopped Kirby twice holding the talented runner to a total of minus three yards. Holdrof is listed at 6-1-185 and a lineman, seemed to be way to quick for any person trying to block him. 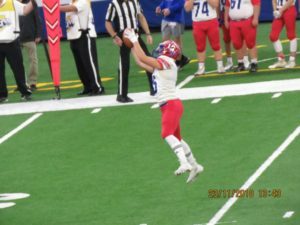 After getting the ball back the Stars would start the drive with a six yard catch from Benson,a 15-yard run from wright and it appeared they were headed for another score. A 13-yard run by Wright put the ball at the Panthers 26-yard line But Clay Dalton would tackle Brett Wethington for a three yard loss, after Wethington caught the ball. On fourth and five an incomplete pass from Wright turned the ball back over to the Panthers. The Panthers would start their next drive with three runs that totaled 21-yards with a 9-yard run by Dylan Bragg being the biggest play of the three. Bragg would find Clay Dalton for a for a 24-yard completion, putting the ball on the Stars 10-yard line.Bragg would use his fast feet to go the final ten yards and put his team up by six, the point after kickoff of the foot of Shilts would make this a 14-7 game, with 3:16 left in the half. The Stars would get back to back to back 13-yards run from Washington and Wright to get their next drive off with a bang.Later in the drive Washington picked up with 17-yards before being stopped by the duo consisting of Edward Keasling and Brandon Davis. Two big defensive plays by Mason Hale that caused a loss of three yards, would force the stars to settle for a 25-yard field goal from Elliott Young to make this a 14-10 game, with :28 seconds left in the half. 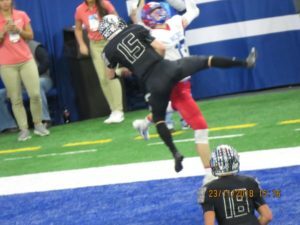 After Andrew McAtee recovered the Panthers on-side kick, the Stars on the first play from scrimmage to start the third quarter, got a 56-yard touchdown pass from Wright to Benson, after the point after kick from Yong was good, this was a 17-14 Stars lead. After getting another three and out from their defense, the Stars offense was right back at it. This time it would take just three plays to light up the scoreboard again. The scoring play was a Wright to Benson 25-yard pass. Wright hit three different players on the drive, with Noah McLendon getting a 11-ayrd catch and then Joe Hendrix hauling in a 19-yard pass. The point after kick from Young was good again, making this a 24-14 game. Eastbrook would get a pick at the 7:13 mark of the third when Drew Cochran made a nice play and then return the ball 21-yards out to his own 36-yard line.The Panthers offense, though could do nothing with the ball and punted it back four plays later. After holding the Stars to a three and out, the Panthers started their next drive by gaining 19-yards on their first three plays,with a nine yard run from Keasling being the biggest of the three.A 16-yard pass from Bragg to Kirby, would set up a 7-yard touchdown run from Bragg to make this a 24-20 game, with 2:02 left in the quarter. Washington would get the Stars ensuing drive off with a sweet 23-yard run.He would also pick up 11-yards along with hauling in a 9-yard pass before the quarter came to a close. 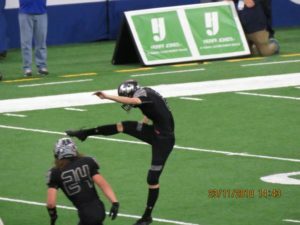 The drive would add three points to the Stars total, after Young hit a 26-yard field goal, with 10:00 left in the game. The Stars defense would give up just five yards on the Panthers next drive, with the biggest play by the unit being a sack of Bragg for a five yard loss by Pat Shallenberger Jr. and Caleb Freeman. Wright and Logan team up again,this time for a 24-yard gain for the games last touchdown,the point after kick from Young was good, making this a 34-20 game and that also would be the final score. Thanks but, a particular reason you posted this game as opposed to the others you've seen? Maybe I read past it but I didn't see a reason. I did not write on all of the Indiana finals. This is one of two I did and it was one I was looking forward to.